You can use PDF renderers to create PDF files, without having to manage Core Graphics contexts. Optionally create a UIGraphicsPDFRendererFormat object to specify nondefault parameters the renderer should use to create its context. Instantiate a UIGraphicsPDFRenderer object, providing the dimensions of the output image and a format object. The renderer uses sensible defaults for the current device if you don't provide format object, as demonstrated in Creating a Graphics PDF Renderer. Choose one of the rendering methods depending on your desired output: pdfData(actions:) outputs the PDF in the form of a Data object, and writePDF(to:withActions:) saves the PDF as a file directly to disk. Provide Core Graphics drawing instructions within the closure associated with your chosen method, as shown in Creating a PDF with a PDF Renderer. 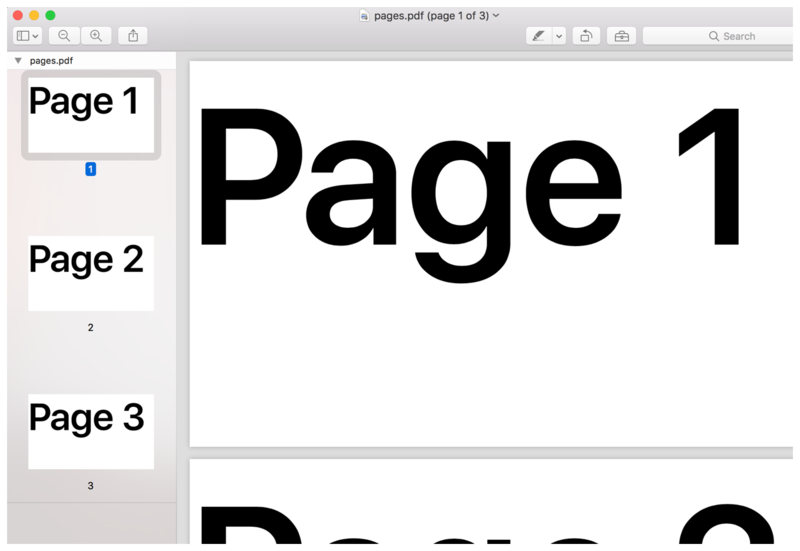 Optionally, you can create a multi-page PDF, using the approach shown in Adding Pages. Optionally, add links to your PDF to make navigation easy, as shown in Creating Internal Links. Once a PDF renderer is initialized, you can use it to draw multiple PDFs with the same configuration. Create a PDF renderer, providing the bounds of the PDF page. You can instead use one of the other UIGraphicsPDFRenderer initializers to specify a renderer format (UIGraphicsPDFRendererFormat) in addition to the bounds. This allows you to configure the underlying Core Graphics context with custom PDF document info. If you don't provide a format, the default() format is used, which creates a context best suited for the current device. Use the pdfData(actions:) method to create a PDF with the PDF renderer you created above. This takes a block that represents the drawing actions. Within this block, the renderer creates a Core Graphics context using the parameters provided when the renderer was initialized, and sets this to be the current context. Before issuing PDF drawing instructions, you must create a page with a call to either the beginPage() method or beginPage(withBounds:pageInfo:) method on the supplied UIGraphicsPDFRendererContext. The drawing actions closure takes a single argument of type UIGraphicsPDFRendererContext. This provides access to some high-level drawing functions, such as fill(_:) via the UIGraphicsRendererContext superclass. The sample code in Listing 2 uses a drawing method on NSString. If you want to create a PDF with more text, consider using TextKit or Core Text, both of which provide extensive text layout functionality. The above code creates the image shown in Figure 1. 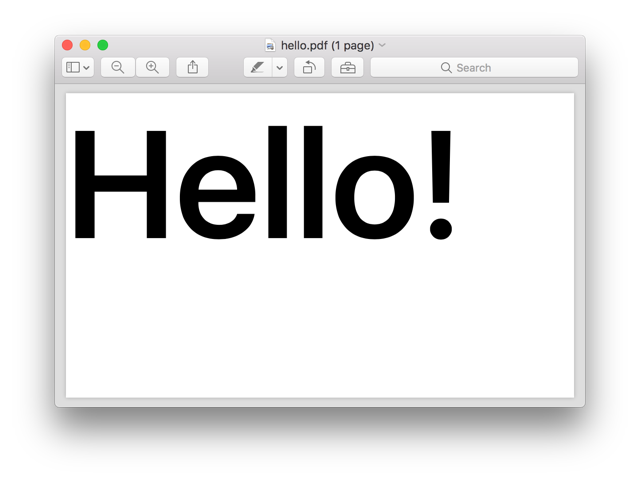 Creating a PDF that says "Hello!" 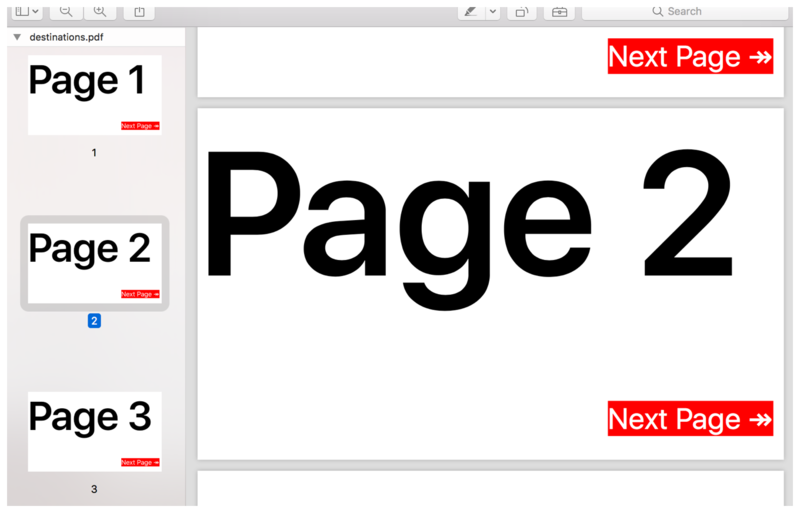 Add multiple pages to your PDF through repeated calls to the beginPage() method on the UIGraphicsPDFRendererContext provided to the drawing block. Use the beginPage(withBounds:pageInfo:) method instead of the beginPage() method if you want to override the default properties for the new page. The code in Listing 3 creates a PDF with three pages, each of which contains the current page number as large text, as shown in Figure 2. A named destination. This is simply a point on a PDF page. You create these with the addDestination(withName:at:) method on UIGraphicsPDFRendererContext. A link region. This is a rectangle on a PDF page, which when tapped, instructs the PDF viewing app to jump to a specific named destination. You create these with the setDestinationWithName(_:for:) method on UIGraphicsPDFRendererContext, providing the name of the destination to jump to, and the bounds of the active link region. The code in Listing 4 demonstrates how to use destinations with a PDF renderer by showing how to create links that jump to the next page. The code in Listing 4 adds large red labels that when clicked will jump from the current page to the next page. Each page has a destination with names of the form page-1, positioned at the origin. The bounding box for the next-page label is used as the link to the destination on the following page. The addDestination(withName:at:) and setDestinationWithName(_:for:) methods on UIGraphicsPDFRendererContext use the underlying PDF coordinate space, which has its y-axis flipped with respect to the coordinate system used by Core Graphics. You can translate between the two using the userSpaceToDeviceSpaceTransform property on CGContext, as shown in Listing 4. Figure 3 shows the PDF that results from the code in Listing 4. Creates a new graphics renderer with the given bounds and format.